enthusiastically embraced by the gaggle of nieces and nephews, not to mention some of the curmudgeons at the grown-ups table. for and toss it in a basket. Everyone then picks one and reads it out loud. Not theirs – one written by another family member. some are small. You learn that what was a small thing to someone to do turns out to be very big for another person sometimes. Could You Please Pass the Science? found that gratitude can increase physical activity levels, reduce the effects of stress and improve sleep (Lavelock, et al., 2016). Depending on your preference, this can be done at the beginning of the day or the end of day – or even both. that you are most grateful for – stay with it until you come up with three. Make them specific rather than generic. Just don’t rattle off the same three each time. Try it for a few weeks and see what you notice. to ” I get to do……”. 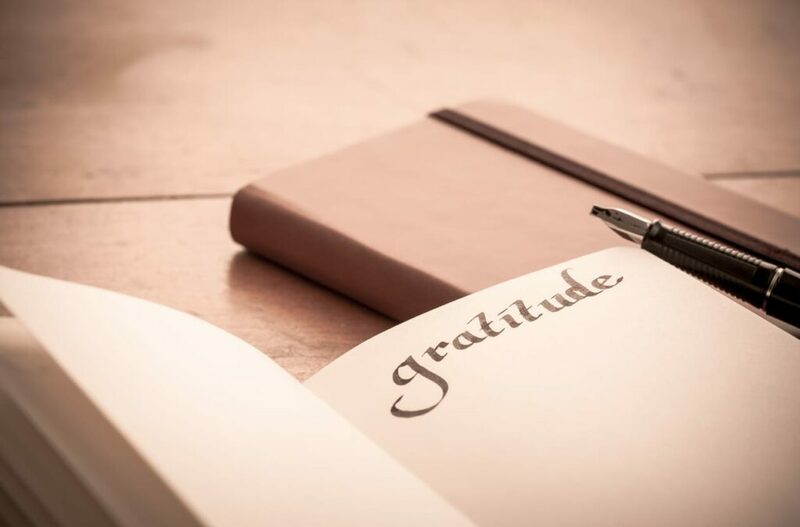 There’s a lot of gratitude packed into that shift of just one word. What do you get to do? which includes a section on gratitude. Family members who’ve used it like it. and appreciate along the way. Lavelock, C. R., Griffin, B. J., Worthington,Everett L.,,Jr, Benotsch, E. G., Lin, Y., Greer, C. L., . . . Hook, J. N. (2016). A qualitative review and integrative model of gratitude and physical health. Journal of Psychology and Theology, 44(1), 55-86.